The fronts of the oval stations are embossed with a Chinese flower-and-leaf motif. 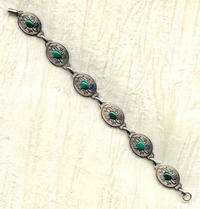 The 7-1/2" bracelet closes with a foldover clasp. Simple, elegant and simply elegant ... It's from SPARKLE PLENTY, of course.